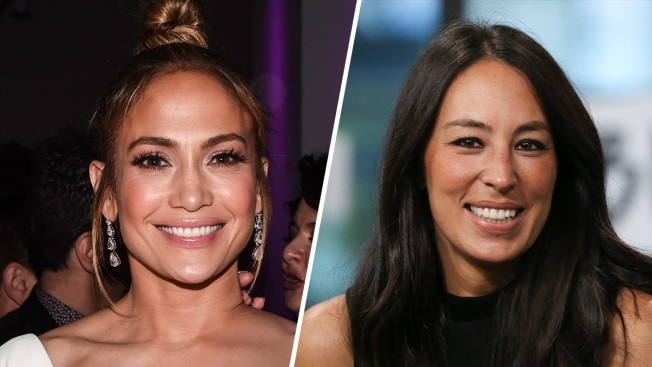 Jennifer Lopez (left), Joanna Gaines (right). Jennifer Lopez and Joanna Gaines are joining forces to create the ultimate beach-side getaway. The "Jenny From the Block" singer is enlisting the help of the HGTV Fixer Upper star in renovating her $6.6 million Malibu mansion. Jennifer and Joanna were spotted checking out the beach house last week, with TV cameras following their every move. It was only last week when J. Lo revealed how she was able to nab the highly sought after designer while visiting the Ellen DeGeneres Show. "We actually got a little fixer upper next to the water and we were like, 'Oh we gotta fix this up.' It's really a house that needs work," Lopez explained. "I was like, 'Wouldn't it be amazing to have her do it for us?' But she doesn't do anything outside of Waco. Like, nothing." Little did she know that her boyfriend, Alex Rodriguez, was busy making her wish a reality in honor of their second anniversary. She shared, "And then comes our anniversary... he goes, 'I want you to go to this meeting with us for the architect for the house.' And I was like, 'OK, great.' And he opens up FaceTime and it's Joanna Gaines. And I was like, 'Are you kidding? Hi!'" When J. Lo first shared the news, she didn't think that Joanna, who is primarily located in Waco, Texas, would be able to make the trip to help the star redesign her home, but where there's a will there's a way! Now, the stars are planning out how they can combine Lopez's desire for a cozy interior with Alex's taste for modern design. "He just goes all the way modern. Like stones and woods and, you know, and marbles and I'm like, 'Can we have a pillow and a blankie?'" If her work on "Fixer Upper" is any indication, Joanna should be able to find the perfect combination of modern and traditional. Unfortunately, the HGTV show ended last year after four seasons on the air, but they plan to make their big return to TV with their own network, which is happening thanks to a partnership with Discovery Channel. Fingers crossed that fans will get an inside look at the renovation process for J. Lo and A-Rod's home on the new network.